I’ve been reading a great book by Daniel T. Willingham titled Why Don’t Students Like School? It’s fascinating for a number of reasons and I’m going to talk about just one of them in this post. It seems that old Bacon was on to something when he said that Knowledge is power and this is strongly supported in Willingham’s book. 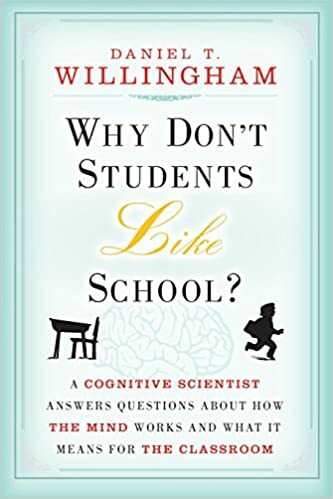 The author’s contention is that students don’t like school because we teachers have them spending too much time thinking. Yes, you read it right, thinking is bad…if you do too much of it! This is because thinking uses up Working Memory which is slow, inefficient and tiring whereas Long Term Memory is quicker and more efficient. For example, we teach our young children to remember number bonds. This is good because it means that when a child is working out a maths problem in their head they are able to do some of the working out simply by extracting knowledge from Long Term Memory. If we give them a problem to solve that doesn’t draw on any of their background knowledge the working out takes longer and is more tiring for the student. We’ve all observed this and it makes so much sense when we think about it [pun intended]. So how do you use this knowledge to plan a great lesson? By considering how much time your students will be spending in both Long Term Memory and Working Memory. I would argue that 30-40% of learning time is plenty long enough to spend in working memory, therefore the majority of learning time should be spent developing background knowledge. Start by considering what big question you would like students to be able to answer. Then plan out all the background knowledge they will need to answer that question successfully. Once you have that you will be able to plan a lesson that fascinates the kids and gives them just the right amount of challenge. Remember, Working Memory uses up lots of energy and tires children (and adults) quickly so invest more of your learning time in growing your children’s background knowledge. When it comes to challenging them with a big question, make sure they have the knowledge to answer it and you’ll be astounded at the quality of thinking that will come as a result.